You can now create your own Navy Ship's Cap. 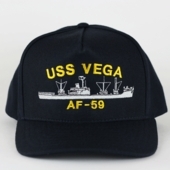 WWII, Korean War, Vietnam War, Gulf War, Decommissioned, War-Loss and Current Vessels can now be custom-embroidered for you on the front panel of these Premium, MADE IN USA, Ball Caps. The ship's name, hull number will be direct embroidered in gold and the ship will be embroidered with a silver-gray silhouette. Submarine caps are embroidered with Silver Dolphins for Enlisted or Gold Dolphins for Officers. All cap designs adhere to the same traditional U.S. Navy design that's still in use today. All of our custom hats begin with a MADE IN THE USA premium 5-panel wool blend hat. The hats are one-size-fits-all with an adjustable two-piece cloth Velcro strap. The hats fit sizes up to 7 and 3/4. Below is a partial list of U.S. Navy Ships available for caps.